FALLING DRY BY JOHN HOOPER. A MIXTURE OF OLD-TIME AND BLUEGRASS. JAPANESE PATROL BY JOE MORLEY. 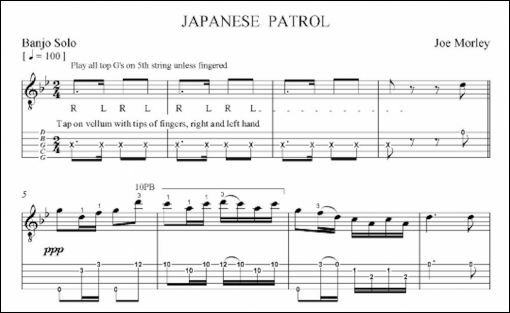 Location: /Sheet music/Fingerstyle Banjo/JAPANESE PATROL BY JOE MORLEY. 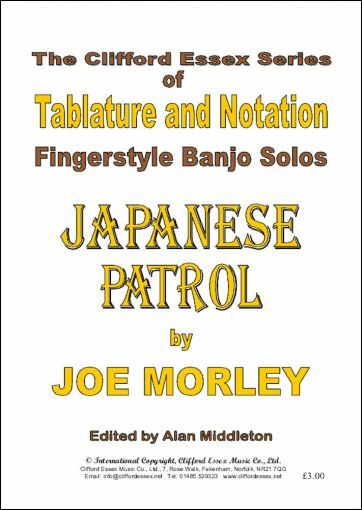 There are thirty titles mentioned in the ‘Short Biography of the Unique Joe Morley’ published by Clifford Essex, and they are all gradually being added to the ‘Notation and Tablature’ Catalogue of fingerstyle banjo solos. This one is an oddity, like ‘Bagpipe Patrol’, but making use of unusual harmonies rather than an unusual tuning. Its attraction lies in the ‘patrol’ aspect, beginning with some drum taps and very quiet melody notes, increasing in volume to a double forte, and then gradually decreasing to a pianississimo. Not easy to perform on the banjo, but well worth the effort. The example given here has not been played as a ‘patrol’ in case listeners think it has been badly recorded!